HEEDING A CROWS WARNING . . . . . . . In late May I headed to the extended backyard (X-BY) for a hike. When reaching the X-BY from the path behind our home several crows were giving warning calls from a nearby tree. I thought there must be a predator nearby. I slowly moved in their direction hoping to catch a view of their concern. As I got closer the volume and repetition of the calls increased. That’s when I noticed one of their own was lying dead below a power pole. The calling crows left as soon as they realized I had located their concern. 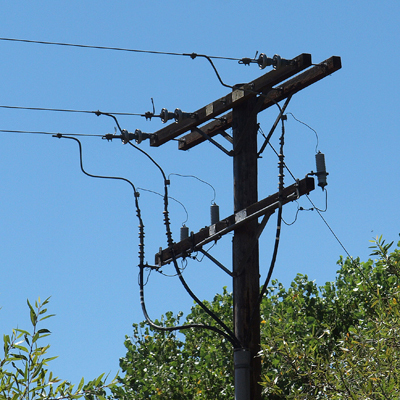 Looking at the top pole, directly above the location of the dead crow, I noticed a matrix of uninsulated wires and concluded that the crow probably met its demise by electrocution. I felt bad, but then it was just a crow I thought, and I continued on my hike in the X-BY. On subsequent X-BY hikes I made it a routine to check the area below the pole . . . . . just in case. As the weeks went by no more bird electrocutions were noted and I began to feel that he crows electrocution was probably just an isolated incidence. Just before sunrise on July 20, 2010 we lost power to the house for about 45 minutes. I didn’t think much of it at the time. Two days later I headed to the X-BY for a hike. My pole checking routine was now ingrain and I headed first towards the power pole . . . . . . just in case. As I came closer to the power pole I noticed something lying beneath the pole that blended into the ground. The closer I got to the pole the features of the bird lying below the pole became apparent. 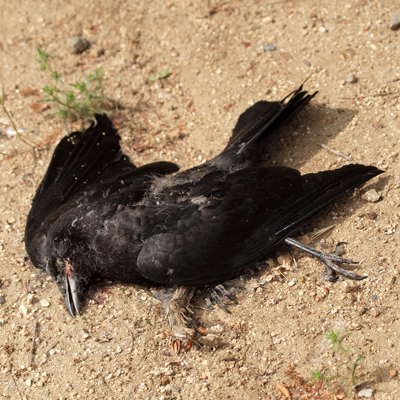 This bird was lying on some of the remaining crow’s feathers where it fell several months earlier. I was devastated to see this beautiful expired Barn Owl at the base of the pole. 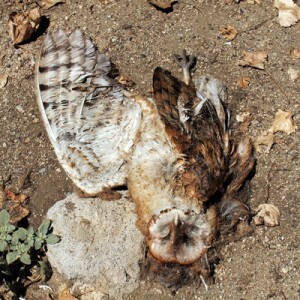 The Barn Owl had been electrocuted. 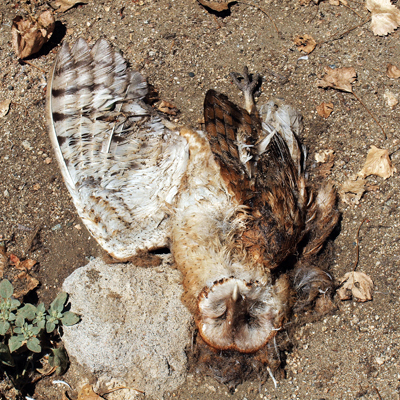 I concluded that the power outage two days earlier was probably the result of the Barn Owl’s demise. The crows had already warned me two months early to do something about the pole, but I didn’t heed their advice then. It took the Barn Owl to motivate me to see if something could be done. During my X-BY hike that day I was not able to get the Barn Owl out of my mind or the crow’s earlier warning for that matter. I returned to the pole before heading home to view the tragedy again. I wondered if there was anything I could do. Arriving home at mid-morning I looked for some place to report the problem. 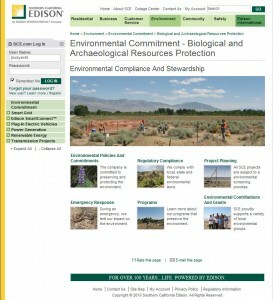 I entered the Southern California Edison (SCE) website and was impressed by its content and ease of use. There, at the top of the website was an ENVIRONMENT tab. 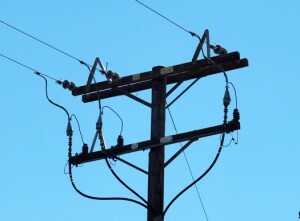 A power utility company with an ENVIRONMENT tab on its website was unbelievable to me having lived in the east coast power gird for the last 30 years. I pushed the ENVIRONMENT tab! 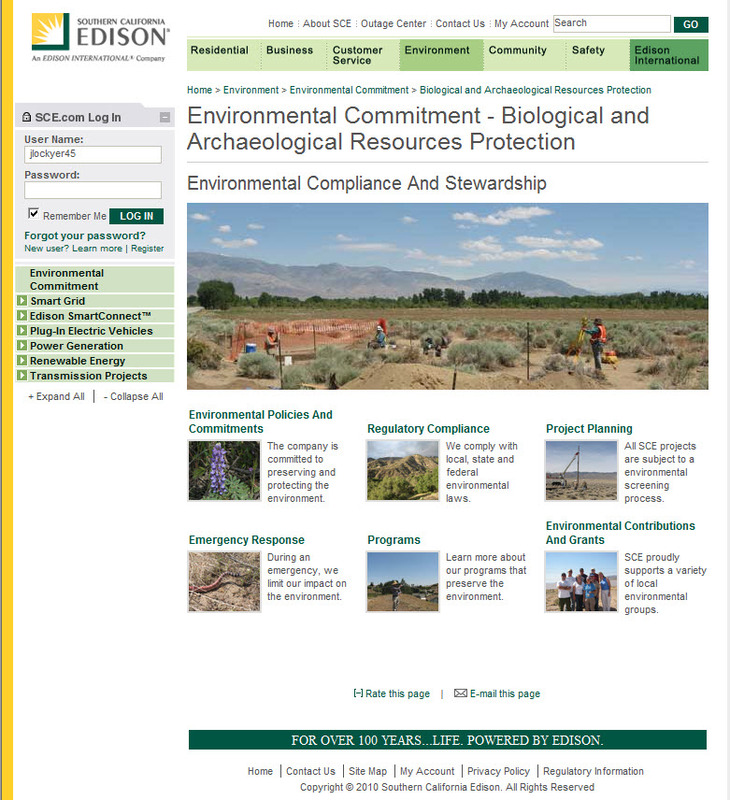 Listed there was a list of SCE’s environmental programs, including one for AVIAN PROTECTION. The contact list for the SCE Environmental Staff listed Archaeologists and Biologists, I sent an email to the Senior Biologists explaining my find and asking whether anything could be done. That afternoon I received an email from the SCE Senior Biologist advising me that my report was a valid concern and that she was directing my email to Kara, the biologist in charge of the Avian Protection program. The following day I received an email from Kara asking for more information regarding the pole location and pole ID number. 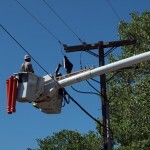 I provided the information to Kara and she responded informing me that an inspector would check to pole. I received a message from Kara several days later advising me that the pole would be retrofitted to prevent anymore bird electrocutions and said a work order had been initiated. She would notify me when the work would be scheduled. A couple days later I noticed a SCE vehicle parked on our cul-de-sac which overlooks the power pole. When I went out to talk to the individual he had already left. While hiking in the X-BY, later in the week, I encountered Kevin who was walking down one of the roads in the X-BY. Kevin was the SCE trouble-shooter who was parked briefly on our cul-de-sac earlier in the week. 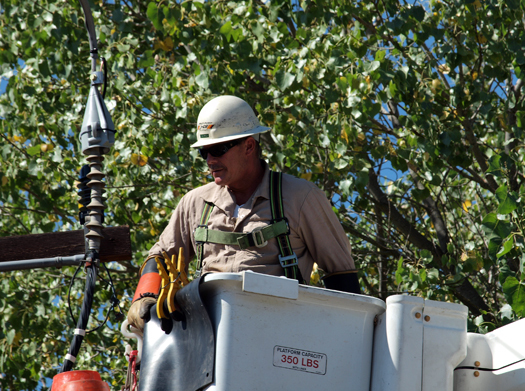 I introduced myself and he explained he was surveying ways to get the SCE trucks into the area to do the work. With two locked gates along the road he explained the possible difficulties of getting to the pole. He told me one way or another they would get the work done. He advised me that the work would be completed within 30 days. 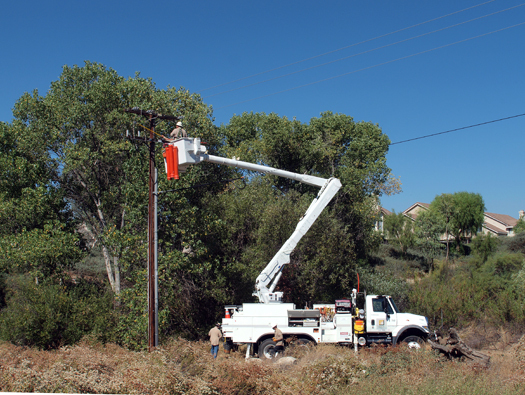 The power pole in question is the last overland pole before the power is directed underground into our development. 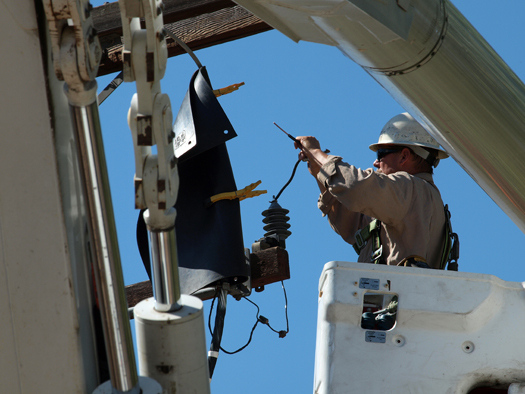 We were heading into the hottest time of year when we received a POWER OUTAGE NOTIFICATION mailer from SCE on August 3, 2010. 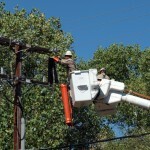 It announced that a power outage would occur on Tuesday, August 17, 2010. 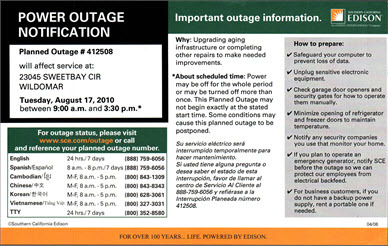 The notice included SCE preparation tips for the long outage and stated that the power to our neighborhood would be shut-off between 9:00 AM and 3:30 PM . . . . . . Oops! 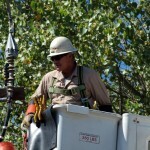 It was already HOT at 9:00 AM on Tuesday, August 17, 2010, when the SCE trucks rolled towards Pole Number 4061682E. I told Kara, the SCE biologist, that I would take some photos of the retrofitting operation. I went to the X-BY as the trucks began setting up. I introduced myself and mentioned to the crew to please don’t tell the neighbors that I was responsible for the power shutdown. I stated that I wasn’t sure all the neighbors would understand the reason for the inconvenience. Fortunately for me, the crew indicated that they were unable to get the power shutoff. 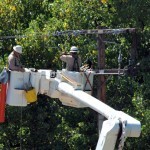 They were going to complete the job by working around the live wires. 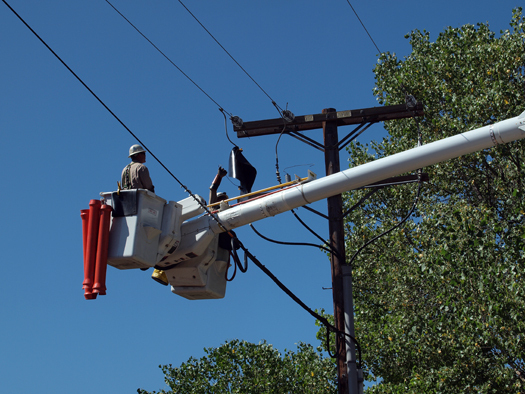 The SCE crew was great and after 2.5 hours had retrofitted the pole working around live wires with temperatures in the mid-90’s. 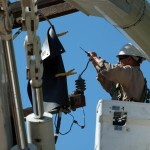 The next day I received a call from Kevin at SCE who wanted to let me know that the job had been completed. He said they almost canceled the work because of the heat but decided to get the work done. Pole # 4061682E is now hopefully bird safe as of August 17, 2010. 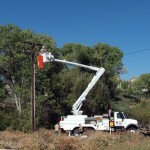 Will I still maintain my routine of checking the pole when starting my X-BY hikes? Yes, I will, . . . . . . . just in case! 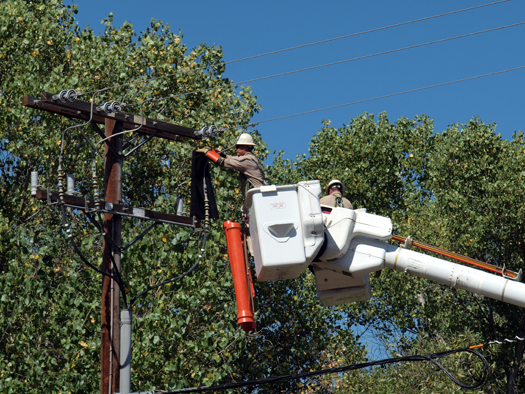 I have been totally overwhelmed and impressed with the rapid response and timely action of SCE to address and correct a seemingly small problem in the context of their entire responsibilities. 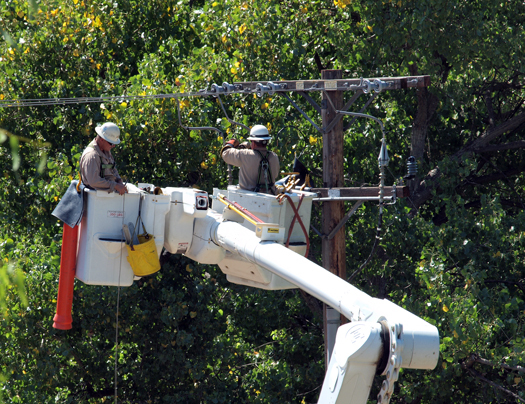 Everyone I came in contact with at SCE, from my initial contact regardng the problem to the crew who retrofitted the pole, were highly professional, courteous, and friendly. They are a dedicated and passionate group of people. Many thanks to all!